Today our firm filed an amicus brief in the U.S. Court of Appeals for the Fourth Circuit supporting the right of a Maryland resident to purchase and possess firearms despite a prior conviction. Hamilton had been convicted of a non-violent felony in Virginia and served his sentence. Later, Virginia restored his civil rights, and then a Virginia Court specifically restored his firearms rights. Today our firm filed a brief supporting a Fourth Amendment challenge to the warrantless use of cell site location information. 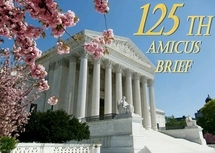 The brief was filed on behalf of DownsizeDC.org, Downsize DC Foundation, United States Justice Foundation, Gun Owners of America, Inc., Gun Owners Foundation, Conservative Legal Defense and Education Fund, and Institute on the Constitution. Today our firm filed an amicus brief in the case of Raymond Woollard, et al. v. Denis Gallagher, et al. in the United States Court of Appeals for the Fourth Circuit in support of plaintiffs-appellees and affirmance. Bill Olson argued the case of Bonnie Henry v. Georgetown University today in Richmond the U.S. Court of Appeals for the Fourth Circuit.